Making an HTML5 slideshow is very easy. You can make a pretty cool HTML5 slideshow within a few minutes. However, some people may have a problem previewing the local HTML5 slideshow. The reason which cause the preview HTML5 slideshow problem is that the HTML5 slideshow is drived by XML files, and the default settings of the most browsers do not allow to load local XML file. We will work hard to find better ways to solve the preview HTML5 slideshow problem, and now, in order to successfully previewing HTML5 slideshow with Safari, Chrome, and Opera, please use the following solutions. Note: HTML5 slideshow can work fluently in Safari, Chrome, Opera and other browsers. There is no problem of viewing online HTML5 slideshow. This page is for solving the problem of previewing local HTML5 slideshow. Please know that this problem is allready solved in the next version. Click the error message below to get the solutions. 1. Safari --- Error: "null" is not an object. Safari needs to load the xml file to preview HTML5 Slideshow. If Safari fails to clear the caches of the previous HTML5 slideshow, the newly opened preview window will show the following message. All you want to do is to clear the caches. You can temporary solve the HTML5 slideshow preview problem by exiting Safari and reopenning the preview window. Or you may need to take the following steps to solve it permanently. Step 1. Press "Command" and "," to get the following window. Step 2. 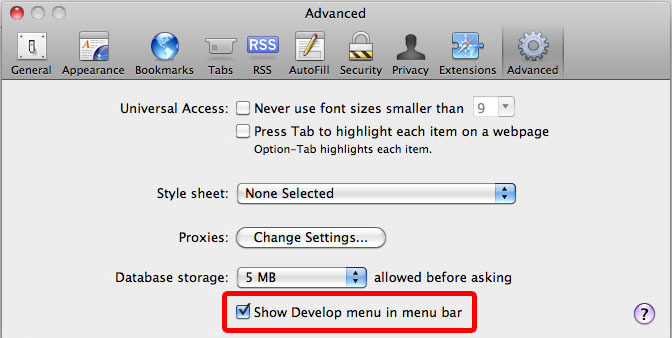 Check the "Show Develop memu in menu bar". Step 3. 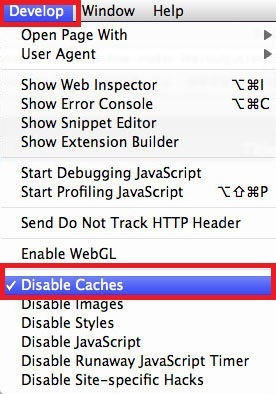 Check "Disable Caches". As the error message shows, safari failed to preview HTML5 slideshow because it declined the request of XML and Http files. 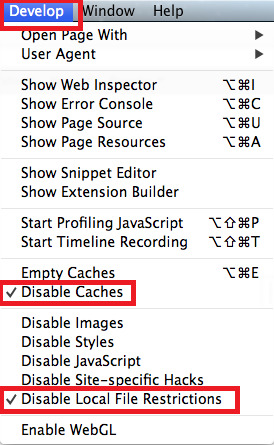 If your Mac is 10.8.2 or later, please check both "Disable Caches" and "Disable Local File Restrictions" to solve this problem. If the problem insist, please take the following steps. Step 1. Exit Safari and open "Terminal". Step 2. Add "open -a '/Applications/Safari.app' --args --disable-web-security" to the end of the content. Step 3. Press "enter". Safari will open again and it will allow to load the local XML and Http files. Because the default settings in Chrome disallow XML and Http file request, so you are unable to open your HTML5 slideshow in Chrome and Opera unless you change the default settings. Step 1. Right click your Chrome shortcut, choose “Properties”, and find “Target”. 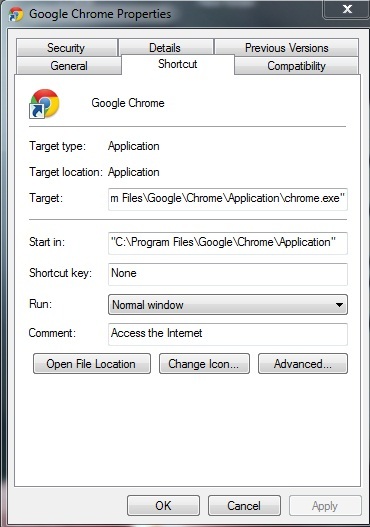 The exmaple of the original content in “Target” is "C:\Program Files\Google\Chrome\Application\chrome.exe", as shown in the following figure. Step 2. Add " --allow-file-access-from-files" to the end of the content. In the example above, the original content is "C:\ProgramFiles\Google\Chrome\Application\chrome.exe", you need to change it to "C:\ProgramFiles\Google\Chrome\Application\chrome.exe" --allow-file-access-from-files. Step 3. Save your change. 4. Opera --- Error: Cannot convert 'b' to object. The default settings in Opera disallow XML and Http file request too, so in order to preview HTML5 slideshow on Opera, you need to change the default settings like below. Step 1. Open Opera, and enter “opera:config” in the address. You will get a frame like below. Step 2. Find “Use Prefs”, click it. Step 3. Find “Allow File XMLHttpRequest”, and put a check mark as the picture below. Step 4. Save your change.